The smallest pieces of the universe are governed by a beautiful and mind-blowing set of rules: the “Standard Model.” The Standard Model explains the behavior of all 17 discovered particles, and it continues to make predictions that have been proven accurate by the largest physics experiments in the world, including the Large Hadron Collider in Switzerland. But the model is incomplete. The Standard Model explains why each kind of fundamental particle exists, as well as how they interact with one another. But it fails to explain why is there so much more matter than antimatter in our universe—one of the biggest mysteries facing physicists today. Experiments designed to answer that question in a roundabout way, like the Large Hadron Collider beauty (LHCb) experiment, have detected tantalizing hints of new particle behaviors that don’t seem to obey the Standard Model. But newer results are clouding the story. The LHCb, one of the experiments on the Large Hadron Collider, was somewhat overlooked during the dramatic hunt for the Higgs boson. But this year, it has pumped out some interesting new results, including one that suggests completely uncharacterized physical rules. It’s especially well-suited to study a physical effect called “CP violation.” But new research demonstrates its findings might not demonstrate CP violation, and we’re no closer to understanding where the universe’s antimatter has gone. Here’s the particle physics background you’ll need to understand the new results: There are six charged subatomic particles called quarks. Protons and neutrons are made from the lighter quarks, called the up and the down. There are four heavier quarks that mainly appear in particle physics experiments and exotic places in the universe: the charm, strange, top, and bottom. Quarks can generally arrange themselves in groups of two (called mesons) and three (baryons). Mesons and baryons with the heavier quarks have a tendency to decay into ones with lighter quarks. Every particle, including these quarks, has an antiparticle—a particle with exactly the same properties but the opposite electrical charge. Particles also have an intrinsic handedness or “parity” that helps determine what will happen to them when they interact with one another. Until 1964, scientists thought all particles should have CP, or charge-parity symmetry, which says that a particle should obey the same laws of physics as the mirror image of its antiparticle partner. The thing is, that’s not true in all cases. In 1965, a team of physicists discovered that one combination of other fundamental particles called a “k meson” or “kaon” broke the symmetry in an experiment at Brookhaven National Lab. But there aren’t nearly enough examples of this “CP violation” phenomenon to explain why the universe has so much more matter than antimatter. 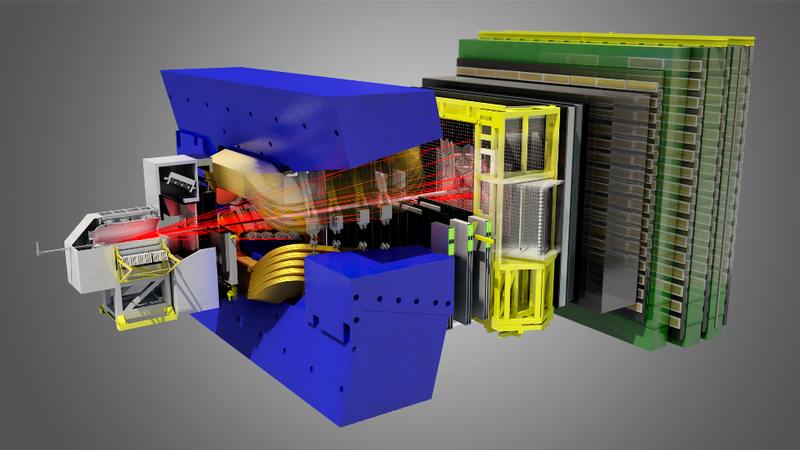 Scientists have since moved on to hunting for CP violation in a new kind of experiment, focusing instead on a heavier combination of particles called “B mesons,” those which contain at least one bottom quark. These particles can turn into their antiparticle and back, making them a useful tool to study this strange matter excess. Perhaps the ways these particles oscillate into one another and then decay into the more common particles could explain the missing antimatter. Most recently, the LHCb reported results on a process that could have yielded another example of this CP violation. In that paper, published last week on the arXiv physics preprint server, physicists measured the complicated interactions of a kind of B meson containing a bottom quark and a strange quark. These particles can turn into their antiparticle before decaying into other particles. They also observed other combinations of these particles changing identity and decaying. Everything they witnessed happened as the Standard Model would predict—the particle and antiparticle behavior was symmetrical. That’s not trivial, explained Koppenburg. Past measurements of B mesons at other experiments, which featured down quarks instead of strange quarks, have found slight cases of CP violation. And last year, LHCb released new results hinting at something strange going on in the decays of those B mesons. But without observing CP violation, those results won’t answer the deepest questions LHCb set out to answer. That bothers Koppenburg—the Standard Model seems to account for the existing cases of CP violation, as well as for the new lack of violation, despite the looming hints of something strange out there. This is still particle physics, and there are truckloads of data waiting to be analyzed that might reveal more discrepancies, cancel other discrepancies out, and uncover plenty of other particle behaviors that could hide secrets of the universe. But for now, against the odds, the Standard Model seems to hold, and parts of the universe continue to go unexplained.